Can you hug a cactus? Many of them seem cute, almost huggable. And some even have cute names, like "teddy bear cholla", or "queen of the night". Their blossoms are often magnificent, with a riot of colors and shapes varying from the incredibly ornate to the simply improbable. 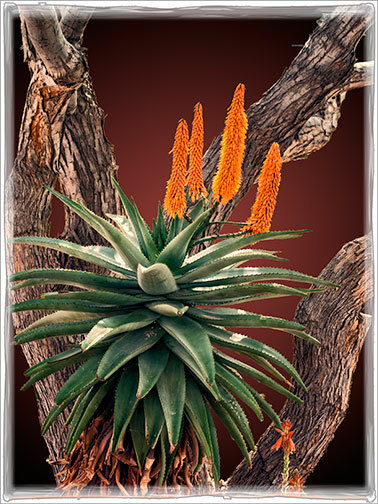 We feature some of them here, together with agaves, aloes, yuccas and other pointed plants. We recommend that you hug just the art. Both you and the prickly things will be happier. Digitography is made for flowers and plants. Take a look. Be sure and check our other galleries as well; they overlap a little. For your convenience, we've placed only a few images on each page of this gallery. When you are ready, go to page 1 or 3 in this gallery, or use the tags at the top to view other galleries on our site and place your order. Ocotillo Inspectors©. The entire field has almost nothing dressing it up other than these strange thorny sticks and a few clusters of cholla. But from time to time in the summer, the monsoon rains bring sufficient moisture for those sticks to bloom and even green up a bit. 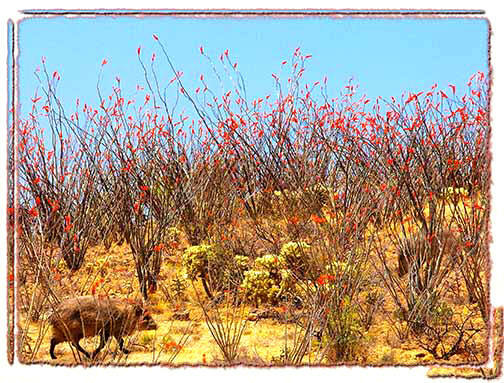 Now the javelinas are out hunting for succulent roots and checking to be sure that everything is flowering beautifully. It is. On a Warm Day©. On a warm day, if you are a small Sonoran lizard, you take the opportunity to go out for a little exercise. The little guy at the bottom is overjoyed by the warmth of the day and is doing his push-ups. All together now, a one, and a two…. Perhaps a healthy exercise schedule somehow attracts a little mate. On Gossamer Wings©. Here a little iridescent blue-green humming bird, native to Arizona, is intent on catching some sweet nectar from a Baja fairy duster. This image is rare, and clearly shows the structure of the wings. 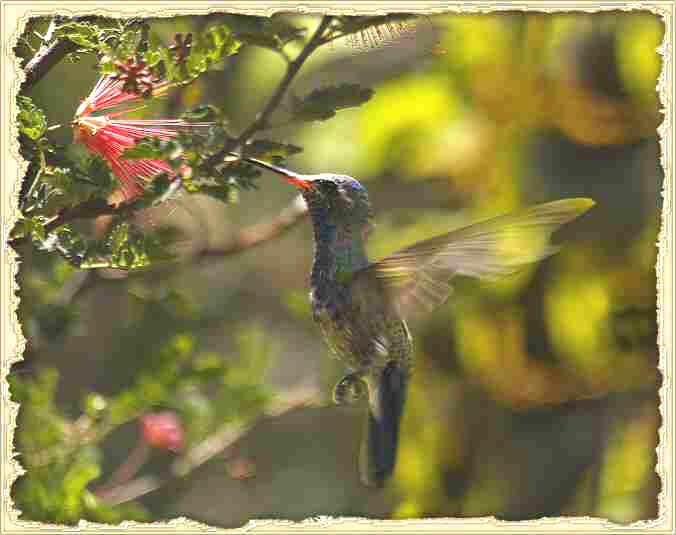 Usually these critters are caught only with the mind’s eye as a blur flitting between flowers. Orange Glow© shows a brilliant orange-flowered aloe blooming in front of the branches of an old mesquite. Perhaps the aloe is thinking of climbing steadily up to meet the top of the mesquite. In fact, the mesquite may be important as protection for the blooms against cold weather—for aloes have the unusual habit of blooming in the winter. But this guy is doing fine and showing off for you. Perfect©. Trichocereus look at first like tiny versions of saguaros. They typically grow only two to three feet high and sometimes have multiple trunks and branches. But unlike their bigger brothers, the trichocereus can flower anywhere near their crown—and their flowers open wider than their entire trunk. Best of all, they can be covered in several brilliant colors. Perfect is like that: it is surrounded by blooms open as wide as your hand. Take a moment to enjoy the soft fragrance. Powder-Puff©. This little flower is absolutely stunning and it wants to be enjoyed. But we sure can’t identify it. Perhaps it is the only one of its kind and it needs a little love. Prom Date©. The columnar cactus here is all decorated for prom night. Like a lovely lady, she presents a stately image of beauty. But in this case she is twice our height, and expects to be even taller when she finally grows up. Purple Passion©. Be careful where you walk! 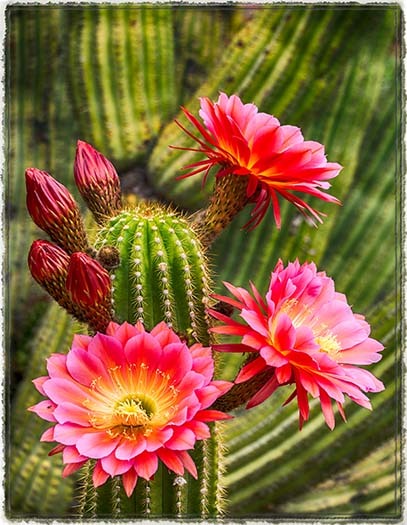 Here a small cactus squeezes between other cacti and the rocks it is growing from, blooming unexpectedly with an enormous four-inch wide blossom. It is tempting. Enjoy the beauty, but now be careful what you touch! This little guy is well-armed to defend itself against the unwary.